Changemaker High School falls quiet around a quarter past 3 o’clock; the campus decorated with a few lingering students and teachers. The Arizona Serve office and its inhabitants begin to trickle out, slow down, and prepare to head home for the day. But on two Wednesday evenings per month, the campus welcomes a few afternoon dwellers into the Prescott College classroom. This group of AmeriCorps VISTA members leave their host sites and gather at Changemaker during these times each month to participate in what they call the “Opioid Cohort.” In 2017 the AmeriCorps VISTA grant was given additional funding to place a small cohort of members working to address opioid addiction, abuse and misuse treatment, and prevention. Members were placed at various health organizations in hopes they’d work together and separately to address the opioid crisis within the Tucson and Prescott communities. Since 2017, there have been two rotations of the cohort who meet bi-monthly to discuss developments in the epidemic and how it’s affecting the country, the state of Arizona, and the local communities in Tucson and Prescott. The group is led by the Tucson VISTA Team Leader, whose spot is filled this service year by… yours truly. I have the honor of leading and coordinating these meetings and members, who are rich in wisdom and resources within their specific roles and cohesively as a group. The setting sun illuminates the space as the Opioid Cohort gathers around a small table, this week with William Collins facilitating the meeting. Will is a VISTA at Banner University Medical Group’s Alvernon Family Medicine Clinic, as the Quality Improvement & Practice Transformation Coordinator. At the family medicine clinic, Will and his team prescribe opioids for things like chronic pain, but also have multiple programs aimed at combating and preventing addiction. Some of these programs include the Controlled Substance Review Committee, where Will aids in reviewing and auditing high dosage opioid patients on a monthly basis to make sure they are staying in control. Another is a Suboxone cohort, where Will actively treats a small group of patients suffering from addiction, using weekly check-ins and Suboxone prescriptions, and a Target Investments Program (TIP), which incorporates Behavioral Health Resources and cross-practice medicine to better manage and address the root causes of addiction and mental illness in patients’ lives. This meeting’s agenda has a few items on it, some old and some new. Recurring items include a discussion about the novel the cohort is reading together, Gabor Mate’s In the Realm of Hungry Ghosts: Close Encounters with Addiction, and a continuing discussion about what legacy this cohort wants to leave behind for the next rotation. The roles of notetaker and timekeeper are filled by two VISTA members who are serving at the Pima County Health Department. The notetaker, Charlotte Smith, works with the Prevention Services program, specifically focused on Adolescent Health Services on the Health Department’s Mobile Clinic, bringing in resources and creating materials on substance use and mental health. Charlotte also partners with Sin Puertas Adolescent Behavioral Health Clinic and coordinates outreach and presentations, including topics such as sexual health, substance use, mental health, and more. Along with Sin Puertas, Charlotte also presents to young adults in juvenile detention at the County Juvenile Detention Center. Timekeeper, Rachel Cummings, works in the Community Mental Health and Addiction program. Her position is focused on prevention through outreach and education, by visiting middle and high schools and presenting to students on the dangers of substance use, addiction, and its ties with mental health and stress. Rachel also works with “Dispose a Med,” which includes outreach around safe disposal methods, and the distribution of drop box locations around Tucson. Rachel is also working on a goal of the Health Department to create a user-friendly and efficient way to search for treatment options in Pima County. This would also include information about substances themselves, suicide prevention, adverse childhood experiences (ACEs), trauma, and resources for some co-occuring issues, such as food and housing insecurity. While some members of the Opioid Cohort are interacting with the epidemic at the forefront, some are related in a more general sense, like Holly Valentine. Holly’s a VISTA at El Rio Health Center, in its Quality Department. Her role involves supporting projects that aim to improve the quality of care patients receive by evaluating current programs for improvement, as well as developing new ones, like designing and piloting a patient tool for midwifery to use and assisting with a colorectal cancer screening campaign. Specific to opioids, Holly supports the Buena Vida Pain Program, which is a pain care program that works with patients to reduce their dependence on opioids to address their pain, as well as educating the staff about ACEs and the role of trauma in substance abuse. Although she has less direct work with opioids than some of the other members, being a part of the Opioid Cohort has helped Holly in reshaping her approaches to other public health projects at El Rio. For me, as I have the very least experience with opioids, learning about the epidemic with this cohort has helped shape my understanding of addiction, trauma, and stigma, and how they interact with almost every fundamental part of life. When the Opioid Cohort first began their meetings, a discussion regarding group goals resulted in the coordination of a few main accomplishments. The first one was a training facilitated by Sonoran Prevention Works (SPW), an organization I will briefly cover later on. The cohort joined together with Arizona Serve staff and Team Leaders to learn about how to use naloxone, the opioid overdose reversal medication, as well as a brief overview of the philosophy of Harm Reduction. The second partnership was a sort of follow-up with SPW, where we brought in materials for creating naloxone kits as a service project for the Martin Luther King (MLK) Day of Service, which was a widely popular project where members from all programs were able to learn a little bit more about the Opioid Epidemic, as well as solutions that are working to address it across Arizona. 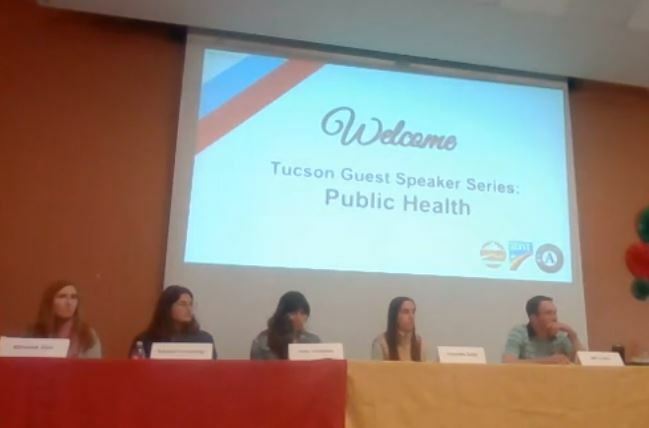 Most recently, the cohort presented at the Guest Speaker Series & Panel on Public Health, at Arizona Serve and opened the invitation for other AmeriCorps members to get involved. One of the Opioid Cohort members, Miranda Gali, took the position of Project Leader on MLK Day of Service and helped in coordinating the training with SPW, as she had previously partnered with them in her role at La Frontera’s Hope Center. The Hope Center is a Medication-Assisted Treatment (MAT) center located in downtown Tucson. It is the oldest MAT clinic in Tucson, and has been in its current location since 1971. MAT is a form of outpatient treatment for individuals with opioid use disorder. The center prescribes methadone or Suboxone to clients, who start their treatment by coming into the clinic daily for services. Methadone is an opioid, and when used in this program it helps individuals prevent withdrawal while also supporting stability in recovery. Suboxone is a combination of buprenorphine (an opioid) and naloxone. Suboxone is similar to methadone in establishing stability, but the combination with naloxone means that if an individual uses an additional opioid, they will be sent into withdrawal because naloxone is a narcotic blocker. MAT is just one of many different types of treatment for substance or opioid use disorder, others include residential/inpatient and intensive outpatient programs. Miranda’s VISTA position works on health projects, such as administering the ACE survey to clients, helping co-lead two women’s groups, and educating clients and providers on antibiotic-resistant infections. There are two additional members of the cohort, who are rarely present in the space other than over the phone or on a webcam, but their presence is influential, diverse, and an awesome addition to the group. Karen Broman and Ashley Tobeck are Arizona Serve members in Prescott, AZ and call in during each meeting to report and represent from the northern third of the state. Ashley is an AmeriCorps VISTA serving at Yavapai County Community Health Services as an Opioid Harm Reduction Coordinator. She provides education and outreach to many different audiences about the opioid epidemic and recent fentanyl overdoses in Yavapai County and is constantly providing community members with naloxone kits through her partnership with SPW. Ashley’s current goals are to increase medication-assisted treatment services in Yavapai County, checking in with pharmacies to make sure they are following the naloxone standing order, and continuing to decrease the stigma regarding people who use drugs. Karen is a medical lab scientist, turned epidemiologist, turned AmeriCorps VISTA, serving at SPW, a statewide grassroots nonprofit whose mission is to eliminate health disparities for Arizonans who use drugs through harm reduction education, advocacy, and evidence-based programming. She is specifically tasked with improving SPW’s practices and scaling up its efforts around street outreach, community distribution in rural areas, and holding treatment facilities accountable to overdose prevention best practices such as take-home naloxone for all clients. SPW believes strongly in the destigmatization of people who use drugs and the philosophy of harm reduction, which encourages and celebrates an individual’s choice to make “any positive change” in their substance use behavior. The cohort had the incredible opportunity to be taught this strategy during our SPW-led training earlier in the year. The Opioid Cohort members bring their own personal knowledge and interest to each meeting, often bringing articles or resources that are newly available at their sites or just excitedly chatting about current events involving the epidemic and public health. During today’s meeting, facilitator Will brings an article from the Annals of Family Medicine on a concept called “Legacy Drug-Prescribing,” this report specifically following the patterns in primary care. My addition to the conversation is saying, “Ugh, I forgot what I was going to tell y’all about… did anyone else listen to that NPR story this morning?” followed by a discussion about how the state of Oklahoma made a big step in the Opioid Epidemic by suing Purdue Pharma for aggressively marketing OxyContin, before Rachel lets us know it’s five o’clock.